Fashing, Atascosa County. Courtesy of Barclay Gibson. Image available on the Internet and included in accordance with Title 17 U.S.C. Section 107. FASHING, TEXAS. 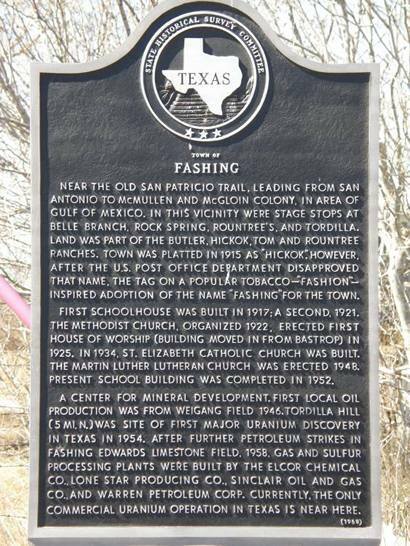 Fashing is at the junction of Farm roads 2924 and 99, twenty-nine miles southeast of Jourdanton in southeastern Atascosa County. In 1916 the 5,500-acre Hickok Ranch was subdivided into farms. The surrounding area had been settled as early as the 1850s by ranching families along the San Patricio Trail. O. F. C. Henke was the first to purchase a small tract of land from the Warnecke and Stieren Land Company, the promoters responsible for subdividing the Hickok Ranch. The settlement was first called Hickok, then Hindenburg; the name Fashing, from "Fashion" brand tobacco and German Fasching ("carnival" or "Shrovetide"), was approved for the community post office in 1920. Albert Schroeder was the first postmaster. Before 1920 residents constructed a one-circuit phone list. Fashing did not have electricity until the 1930s, when the Karnes Electric Cooperative was constructed. Most of the residents of this farming community have been of German descent and have maintained many German traditions. Oil, gas, and uranium have added to the economy. In the 1930s Fashing had a population of twenty-five and five businesses. From 1939 until 1964 it had 125 residents and four businesses. In 1968 it had ninety residents and no businesses. From 1970 to 1990 the population was recorded at fifty, but it dropped to thirty-five in 2000. In 1972 Fashing was proclaimed the "Grand Champion Rural Community of Texas" for its efforts in community improvement. Its first school, built in 1917, was replaced by later buildings in 1921 and 1952. In 1930 a separate school for Hispanic children was constructed. This building was used until the two schools were combined in 1947. The Fashing Common School District was consolidated with the Karnes City Independent School District in 1958. After 1980 the seventh and eighth grades were bused to Karnes City. Grades one through six remained in Fashing until the school was closed in 1988. Over the years, Methodist, Catholic, and Lutheran churches were built in Fashing. The post office was discontinued in 1988. Atascosa County History (Pleasanton, Texas: Atascosa History Committee, 1984). Vertical Files, Dolph Briscoe Center for American History, University of Texas at Austin. Handbook of Texas Online, Robert H. Thonhoff, "FASHING, TX," accessed April 20, 2019, http://www.tshaonline.org/handbook/online/articles/hnf12. Uploaded on June 12, 2010. Modified on May 2, 2016. Published by the Texas State Historical Association.